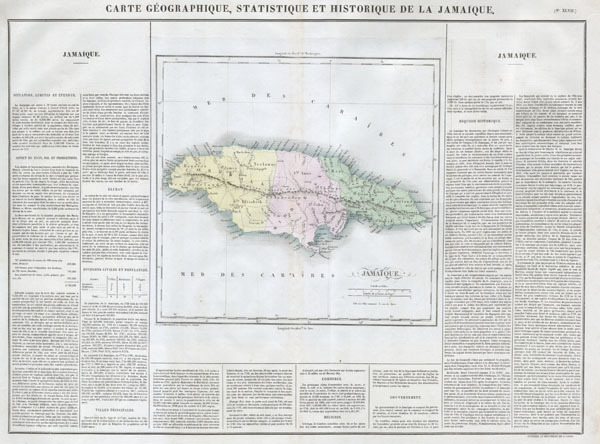 This is a stunning 1825 map of Jamaica, in the West Indies. Features a detailed map of the island itself as well as a wealth of historical and statistical data in text boxes surrounding the map. This was originally published in the 1825 French Edition of Carey & Lea's 1822 A Complete Historical...American Atlas, entitled Atlas Géographique. Statistique, Historique et Chronologique des Deux-Amériques et des îles adjacentes. It was edited and published by Jean Alexandre Buchon. J. Carez (fl. c. 1815 - 1850) was a Paris based book, atlas and map publisher actived in the early 19th century. Little is known of Carez's life. He is best known for his publication of the French edition of H. C. Carey and I. Lea's important Complete Historical, Chronological, And Geographical American Atlas. Howes C-133; Phillips Atlases 1176; Wheat Transmississippi 348, 352.